It has been such a long time since I posted that I thought I should start back with a spectacular photo. 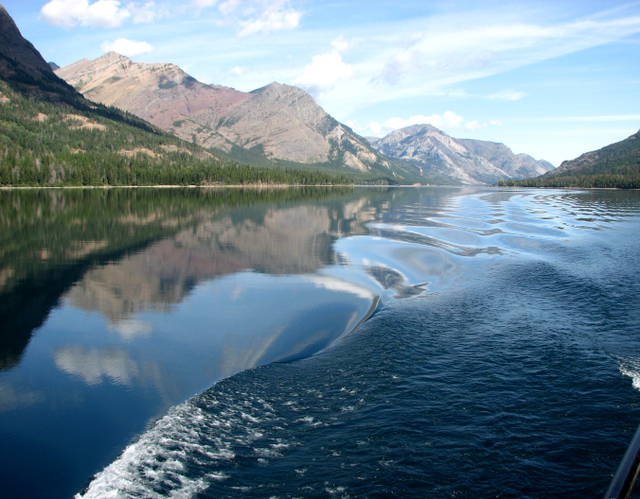 This was taken last week when we visited Glacier/Waterton Peace Park for three days. The second full day there we drove to Canada and took an 80-year-old Historic wooden boat down the lake, past the International border into the U. S and back again to Canada. It was the most spectacular lake shore view I have ever seen. I've got a short time span now as I just used all my blogging time loading a bunch of photos into a photo album on the left side of this blog: Glacier National Park. There are more fantastic views and a few weird photos of patterns, lichens and such. In the next several days I'll write a bit about my crazy summer. 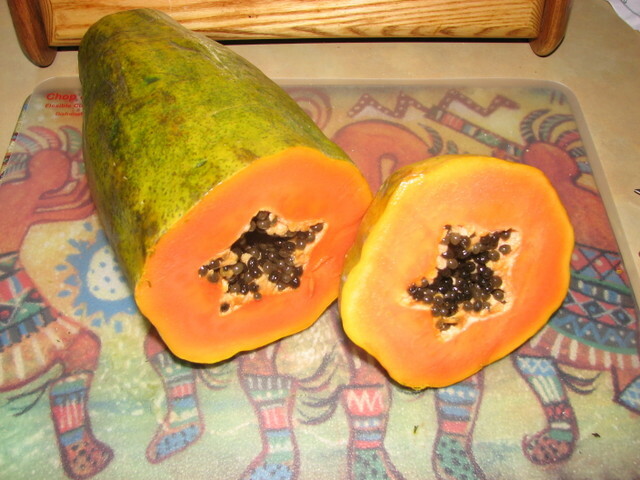 When I first cut this open my first thought was, "Wow this is the second time I've found a recognizable shape in a papaya. How unusual!" But it is not unusual at all. Virtually all of the shapes we humans have discovered and named appear naturally in plants, snakeskins, honeycombs, insect eyes, flower centers, tree trunks, shells etc. Dewdrops on leaves indicate a respite from the dry heat. After several weeks of heat in the 100's we have been thrilled to have days in the 70's and 80's with soaking rains and cloud cover. 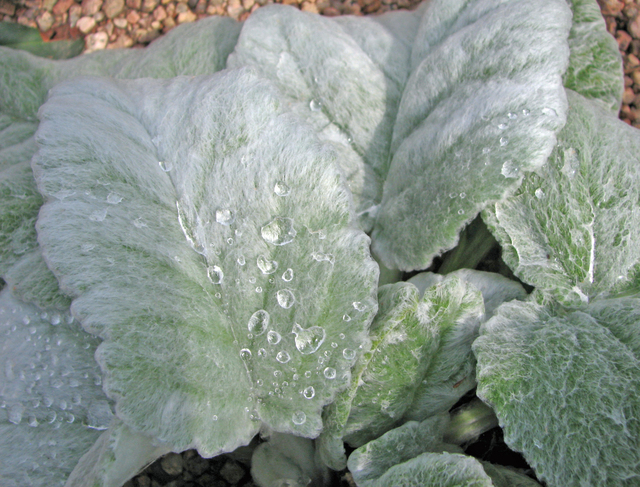 Morning walks show dewdrops which usually would have evaporated in the heat before we could get up and out of the house. In the almost 40 years we've lived in Denver, we've mostly had moderate summers. Our manta once was, "We don't need air conditioning for just 7 to 10 days each summer." In the last 8 to 10 years the uncomfortable days have become the norm and this spring we finally succumbed to before-the-season sales and installed central air in our 66-year-old home. We don't keep it temp-shock cold but on those 100+ days, 80 feels really good inside. 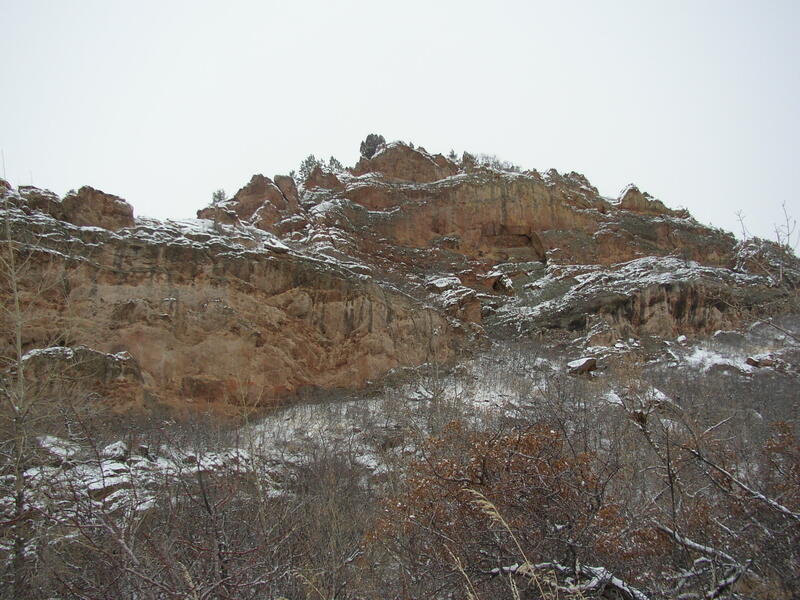 One of the first places on our list when we just want to immerse ourselves in nature is Roxborough Park. It is about 45 minutes from our home. We grabbed a Subway sandwich and walked into the Park to have lunch on a bench and watch the wildlife around us. We saw many birds and deer along the trails. It was a good way to welcome Spring. 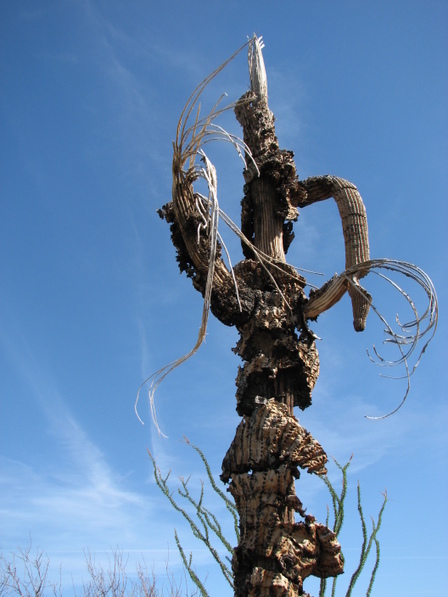 On one trail we saw this Witches Broom in a Scrub Oak. 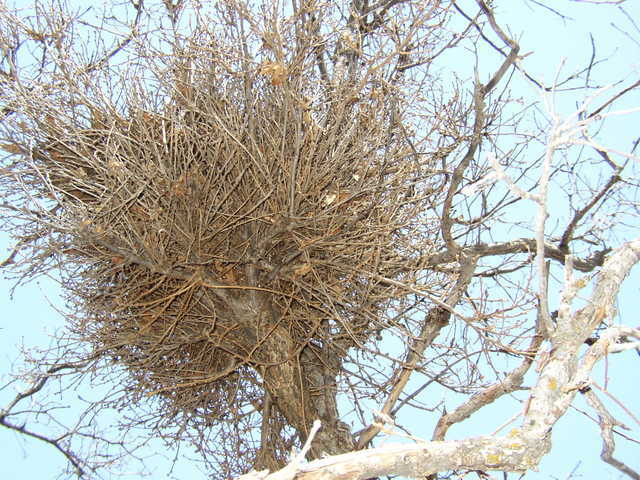 There are a variety of causes for the excelerated growth that causes the nest-like clumps in the trees: fungus, mistletoe or disease. This is one of the largest and most dense ones I've seen. 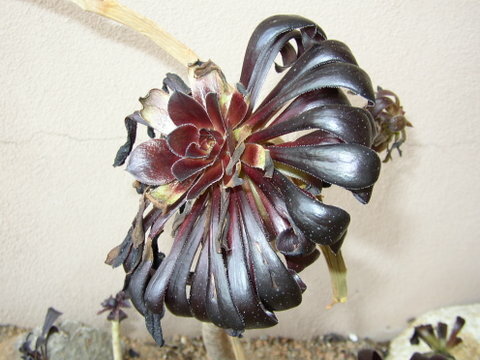 A deep black-burgundy flower in the arid plant house at DBR. On my recent visit to the Denver Botanic Gardens I went into an area I almost never visit--the plant house for succulents and other plants normally found in dry and warm places. I found this beautiful many-petaled flower and a small clump of tiny blue ground-hugging flowers. No names were listed for either but I loved them both anyway. 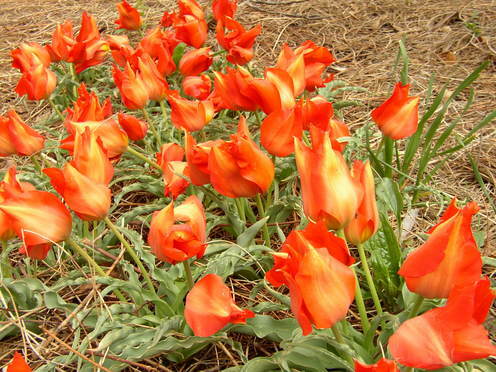 No matter how cold the weather and how sparse the plantings, I always find beauty there in some form. This day was no different. 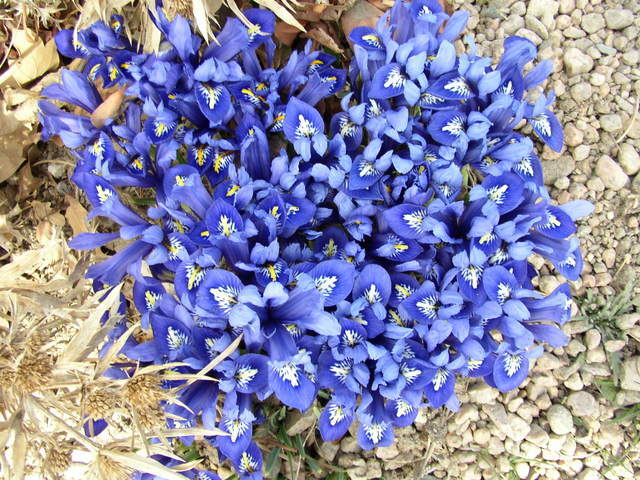 Small blue beauties with white centers. We walked as far as we could without getting into the mud. The geese, ducks and other birds have discovered it and made it home. No doubt in the spring more small critters will move in. I'll definitely be back. 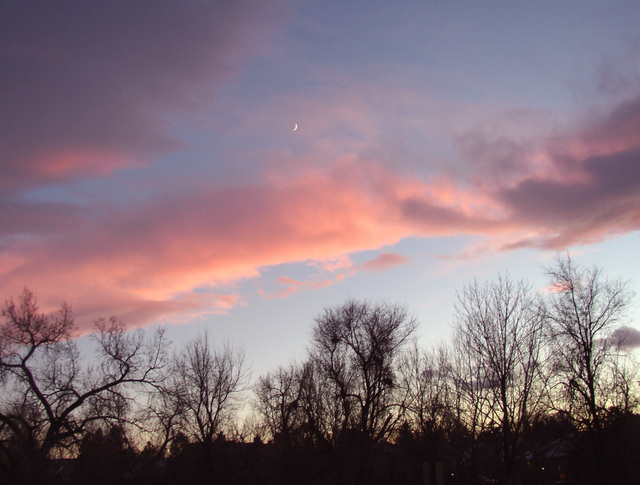 Watching a slice of moon at sunset I hardly noticed the cold temperature. Yesterday afternoon we took our granddaughter to see Christmas decorations at the mall. She loved walking through the gaudy colors of Christmas commerce while I preferred the sunset that met us outside. The high for today was 18 degrees with an expected low of 1 degree overnight. There is definitely a winter feel in the air. Tonight we went to the museum for a holiday/graduation party of the Earth Sciences Department where my husband received his certificate for completing the fieldwork for his paleontology courses at the museum. Despite the blowing snow and chilling temperatures about 200 people showed up. Great fun to get a bunch of earth scientists in one room! Those who spend their careers searching for, cataloging and studying fossilized leaves and bones seem to have a quirky sense of collective humor and more than the average number of card-carrying eccentrics. This is one of my favorite tag-along events each year. No, this wasn't at sunset; it was at 2:30 in the afternoon. The wind was blowing near the ground to create lenticular blotches back-lit by the sun which the turbulent clouds had obscured higher up. By the time we had returned home with our grand-daughter about 3:45, the sky had almost cleared of clouds. I want to speak out for insects. Invertebrates make up 97% of animal life on earth and insects are the largest in number and the most successful of those invertebrates. They perform many of the thankless grunge jobs of the ecosystem. Certainly some of them, like mosquitoes, are inconvenient for humans but often they keep the humans in check and discourage overuse of wetland areas. Insects are pollinators (bees and butterflies), decomposers (beetles), engineers and communal experts (ants, termites and bees). 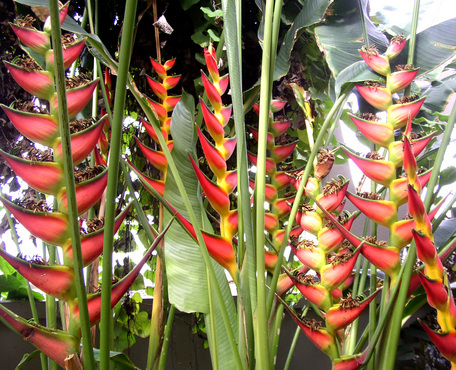 They are variously insectivorous, herbivorous and even carnivorous. The colors, designs, shapes and division of labor within the insect world are fascinating. While they are not warm, fuzzy, charismatic creatures, I definitely respect them. 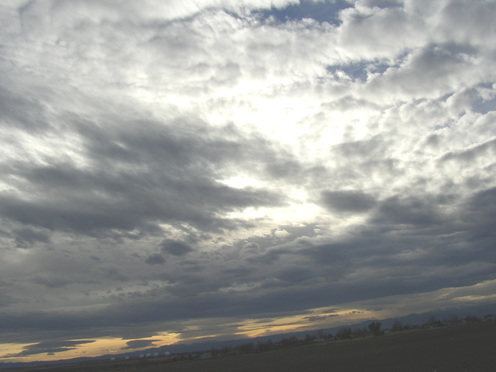 Last weekend we drove to White Ranch Open Space Park in Jefferson County. We had not been there before but were looking for a place that allowed dogs on leashes. It was absolutely beautiful. It functioned as a working ranch from 1913 to 1969 when it was donated by the White heirs to Jefferson county to be preserved as open space. 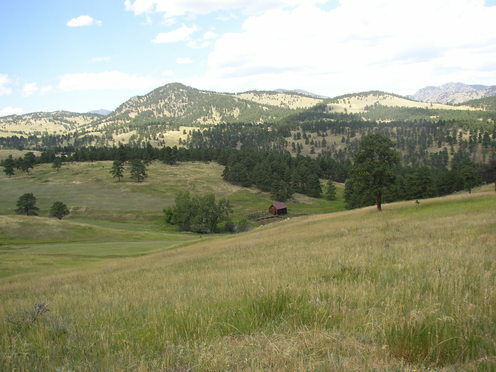 Consisting of several thousand acres, it includes rolling hills, rocky geological formations, Ponderosa and Douglas Fir forested areas and a spacious meadow. We saw deer, rabbits and hawks. There are picnic tables placed under shade trees and 18 miles of marked trails. What a find! We will definitely go there again. Meadow and barn in White Ranch Park. While in T. or C. just after my Mom's death the grief, and trying to be strong for others, occasionally became too much for us to bear collectively so each of us would wander off and lose ourselves in high desert plants that were just on the verge of magnificence. 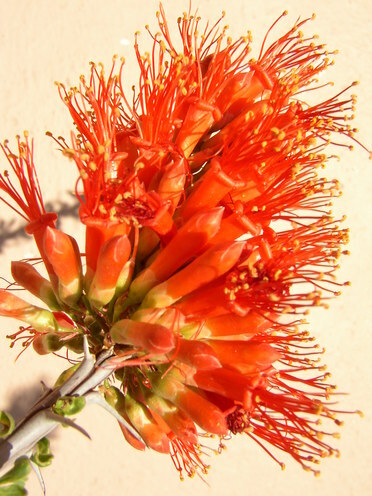 The Ocatilla plants were in full bloom. The various prickly pear and cholla were slowly opening the myriad blooms that topped each each plant. 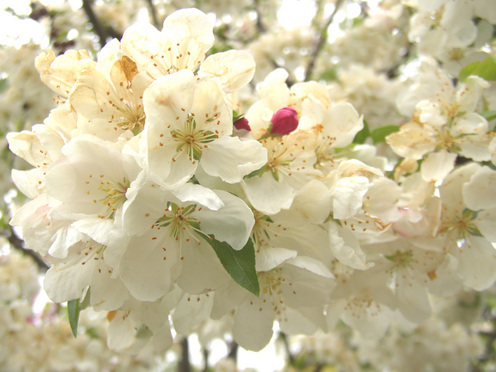 I so wanted to see them all in full bloom but the timing was just a week too early. Still there was wonder enough to calm and distract me . 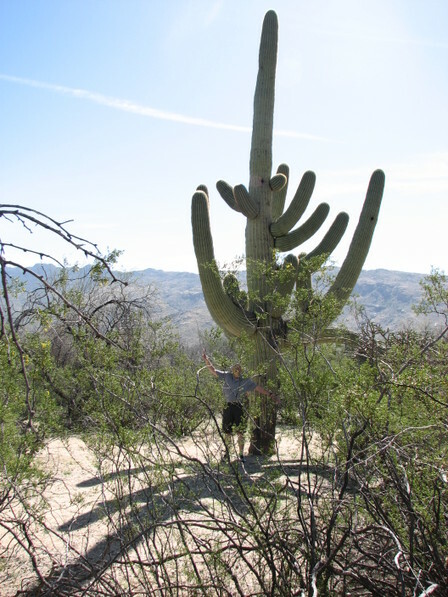 The Joshua trees and Century plants were sending new growth high into the sky. Here and there a bit of incongruity surfaced as daisies and roses bloomed among the various cacti. 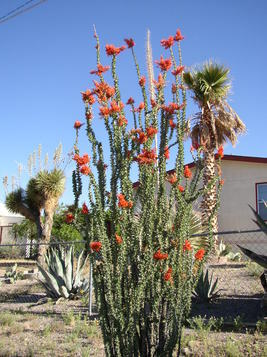 I love a desert in bloom and this year there was enough water to encourage prolific production. Elephant Butte Reservoir is the highest I've seen it in years. It has gained about 40 feet since we were there in January. The Rio Grande River was nearly overflowing its banks, kept in check only by Elephant Butte Dam. 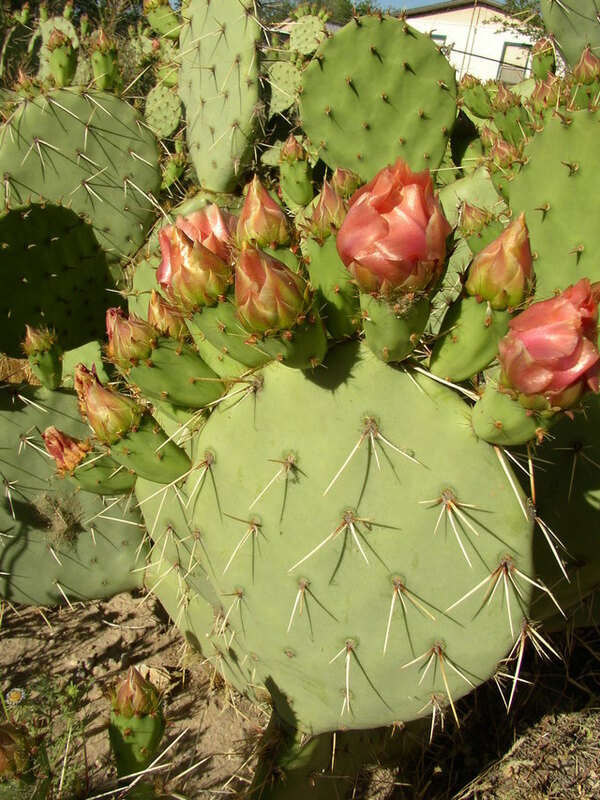 The prickly pear below was in full bloom two days later as we drove out of town on our way home. I can remember how I demeaned the desert before I actually spent some time in one. 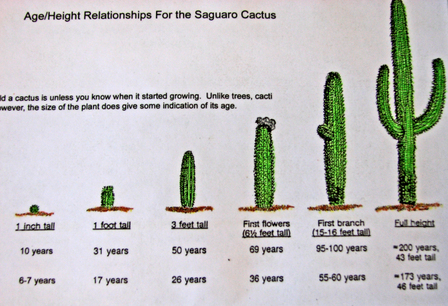 I have personal acquaintance now with several deserts: the high desert of southern New Mexico, the Sonora desert in Arizona and Mexico (though I haven't yet been to the Mexico part), the desert canyon lands in Utah, Colorado and New Mexico and the Atacama desert in Chile. 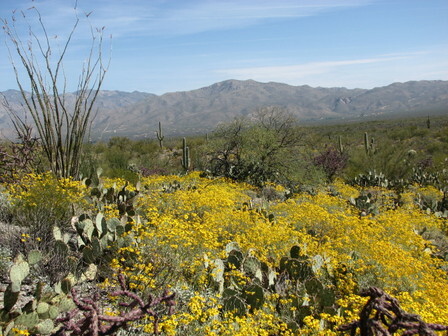 Each of them possesses its own special dry-land beauty and is a testament to the persistence of nature. I love deserts. Those of you who know me or read here often know that I de-stress by getting close to the earth or out into the wilderness. Today I spent about an hour in the DBG. 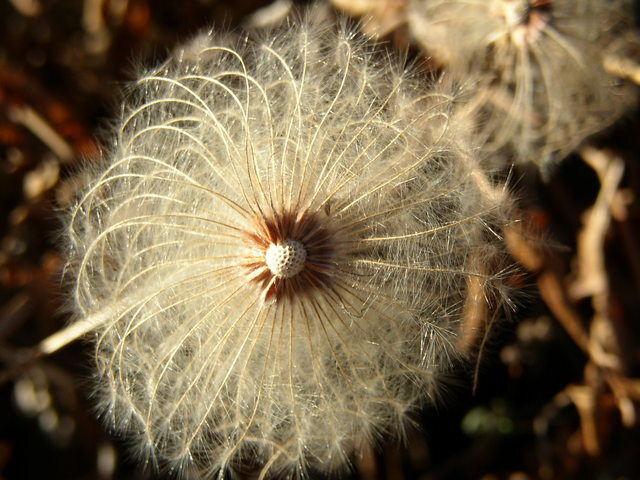 One cannot spend time with such beauty and stay long in the doldrums. I don't know the names of these krinkly plants but I would love to have some for our yard. I also found myself getting up close and personal with crabapple blossoms. The trees are absolutely gorgeous this year. I just knew that someone from the Bush Administration would jump in front of the parade and claim leadership, but my last guess would have been Gail Norton who has quite successfully established herself as the consummate anti-environmentalist, beginning in my home state of Colorado. "Joining the search team at a press conference in Washington DC, Secretary of the Interior Gale Norton announced a Department of the Interior initiative to identify funds for recovery efforts. " "Through its cooperative conservation initiative, the U.S. Fish and Wildlife Service has a variety of grant and technical aid programs to support wildlife recovery. " "These programs are the heart and soul of the federal government's commitment to cooperative conservation. They are perfectly tailored to recover this magnificent bird," Secretary Norton said. 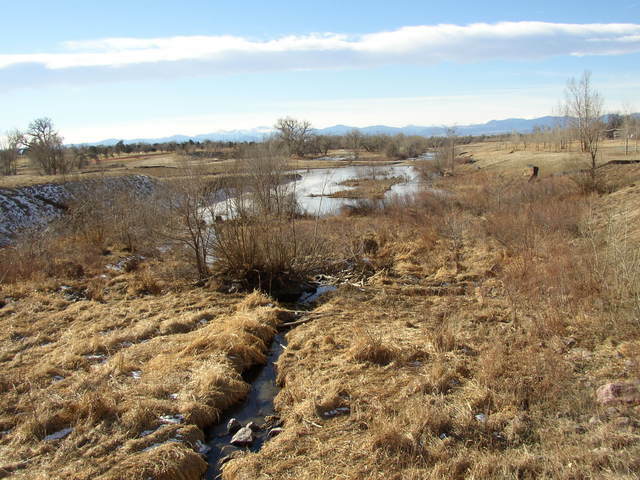 "Across the Nation, these programs preserve millions of acres of habitat, improve riparian habitat along thousands of miles of streams, and develop conservation plans for endangered species and their habitat." Don't get me wrong: I am thrilled that the government is going to find money for saving the woodpeckers, but where the hell have they been when hundreds of other endangered species have been threatened by loss of habitat due to over-cutting forests and polluting rivers, lakes or oceans with mercury? And now that they've jumped to the environmental side of the spectrum, quick let's get the congress to vote down the Budget bill that had the ANWAR drilling permission sneaked into it. Let's save another habitat! I'm sure a press conference could be arranged with lots of limelight for all--if that's what it takes. 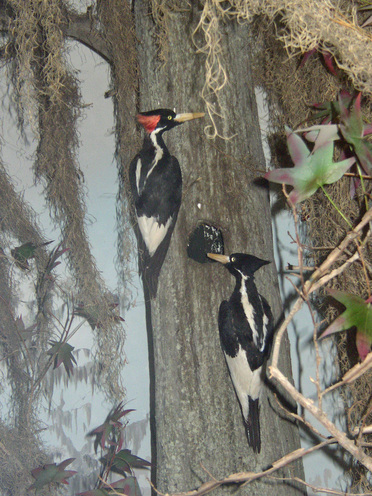 When my husband showed me the article in this morning's Denver Post, I knew I must go to the Denver Museum of Nature and Science and get a photo of the diarama featuring several species of "extinct" birds--one of them being the Ivory-billed Woodpecker. Tomorrow's issue of Science Magazine will feature a report on the research which leads the team from Cornell's Laboratory of Ornithology to believe they have definitely found one and potentially others in the "Big Woods" region of eastern Arkansas. To read a PDF file of the report, click here. There are so many animals, insects and plants being added to the lists of Extinct and Endangered species that it is refreshing to read about a survivor. Recently in my Spanish class one of the group mentioned that she wasn't looking forward to Spring Break as their family was joining some friends in Utah to be "in nature." Since Utah and its canyon country are some of my favorite places to be, I excitedly exclaimed, "Wow! I'm so envious." To which she responded, "I don't want to go. I absolutely hate nature." I like to think I'm open-minded about most things--except Bush, of course--but I had never even considered the possibility that someone could hate all of Nature. Maybe one could dislike certain inconvenient species or unpleasant weather but to declare blanket hatred of all things outdoors is almost inconceivable to me. I have friends who are selective in the nature they enjoy: tropical sandy beaches instead of rocky sea cliffs or sculptured botanic gardens rather than the unpredictable growth patterns of high altitude wild flowers. 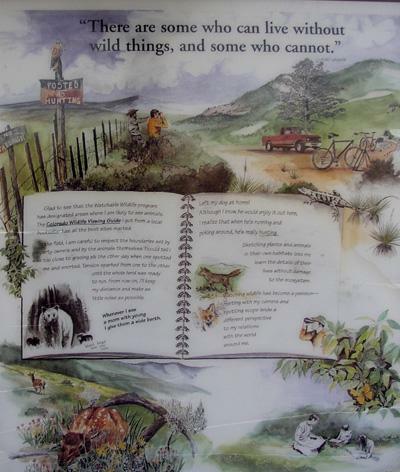 Yet they don't discount the possibility that they could enjoy some form of natural beauty in a wilderness setting. Nature is my stress manager, mind-cleanser and perspective re-adjuster. I can't imagine how I would keep equilibrium in my life, were it not for periodic pilgrimages into the mountains, to the ocean, to the desert or to some other destination where I can "get away, feel small in the greater scheme of things and become calm. Do I have tunnel vision? 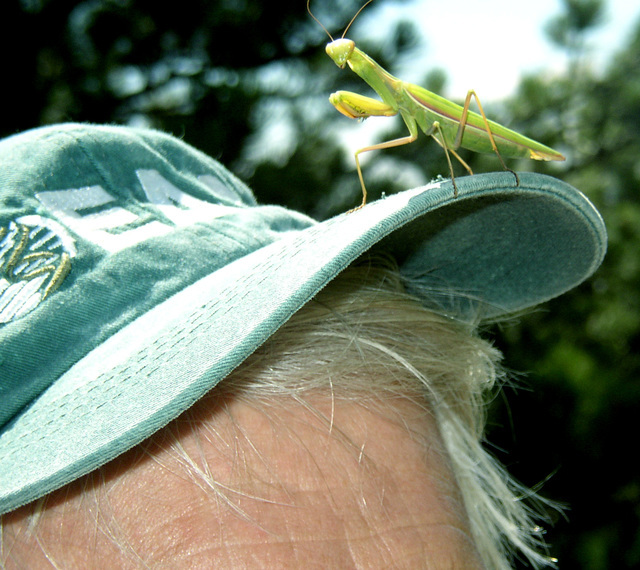 Are there really self-proclaimed nature haters in quantifiable numbers? Are you a nature hater or do you know one? Yesterday we exited Coor's Field, with around 47,000 baseball fans, about 5:30 pm-- right in the busiest part of Rush Hour. Since it was nearing meal time and we had come on the city bus, we decided to walk one block to Mori's Tokyo Cuisine and Sushi Bar to eat and allow the traffic to lessen before we caught our bus home. Since I had my camera with me, I was quite sensitive to photo opportunities. 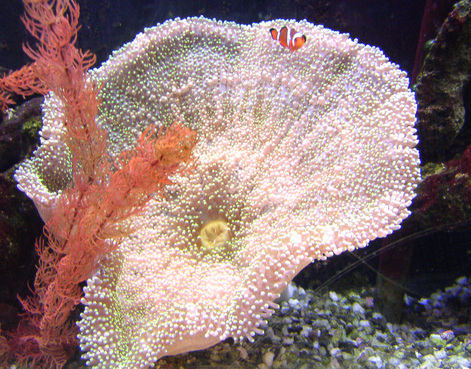 As we entered the restaurant I saw the sea anemone above with none other than Nemo swimming nearby. Of course, I had to have proof that I had found him. As always nature--even imported, artificially heated and misted nature--has a calming effect on me. I've never been one to get terribly stressed, although there were moments during my 18 years as a Real Estate Broker that I allowed unrealistic expectations regarding things over which I had no control to add stress to my life. 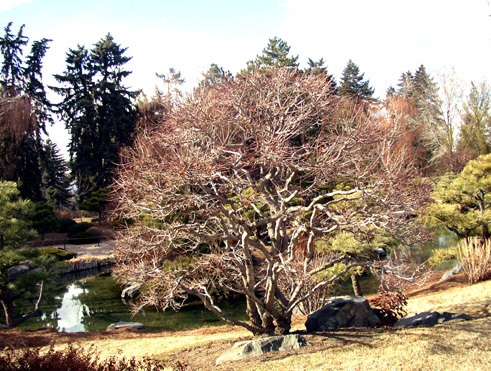 It was during a particularly difficult period, of many foreclosures and houses selling for less than people paid for them three years before, that I first became a member of the Botanic Gardens and the Colorado State Park system. I could pack a lunch and disappear in the forest, mountains, tropical flowers or Japanese gardens for an hour and return calmer and ready to realistically face the facts of the situation. 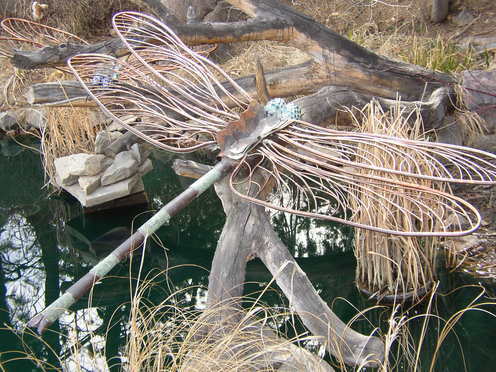 Even the art and sculptures in the gardens have a calming effect. This time of year we don't see many signs of wildlife--not even the ever-present prairie dogs--but we did see at least seven deer roaming the prairie and finally settling in the thicket where, with the help of a patient husband and a not-strong-enough zoom lens, I captured three of them. 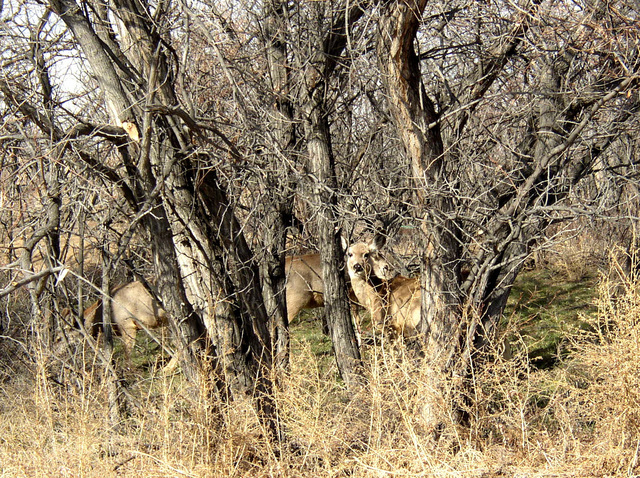 These three seemed to be afraid of people but not vehicles, so Bob slowly edged our Jeepito closer to the thicket which was just off the road. I had readied my camera so that its zooming and whirring noises wouldn't startle them and ten shots later I got one that I liked. I do so enjoy my little camera safaris into our City and Mountain Parks and Preserves. I'm hoping to do another one today as the sun is already bright and warm. We're still having intermittent winter-spring days. We seem to be having more of them this year.. Is it global warming? 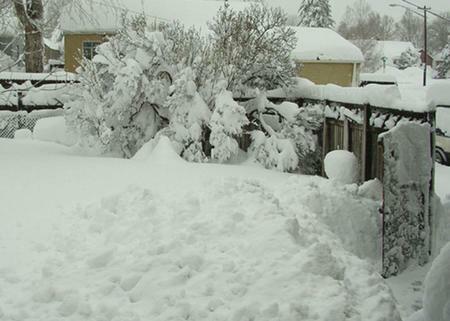 Is it an "El Niño" year? Is it just one of Denver's wonderfully mild winters? I don't know but we've had less snow to pack down the grasses and their golden contrast against the clear sky produces in me a heart-warming glow. We walked today at The Arsenal Nature Preserve, a bird and animal sanctuary created on once-contaminated part of the Rocky Mountain Arsenal. The arsenal was active in the 1950s and parts of it are still being "cleaned." Unknown plant, full of seed potential for next Spring. In October 2004 my husband's 96-year-old aunt died. Three days before we left for our life-affirming trip to Chile we attended a memorial and celebration of her life. I have known many people who professed strong religious beliefs of various kinds, but only a few who really lived their faith on a daily basis. This wonderful woman was one of them. Mend a quarrel. Search out a forgotten friend. Dismiss suspicion and replace it with trust. Write a love letter. Share some treasure. Give a soft answer. Encourage youth. Manifest your loyalty in a word or deed. Keep a promise. Find the time. Forego a grudge. Forgive an enemy. Listen. Apologize if you were wrong. Try to understand. Flout envy. Examine your demands on others. Think first of someone else. Appreciate, be kind, be gentle. Laugh a little more. The language reflects a previous era but the sentiments are worthy of practice. Though I do not consider myself religious in the sense that I believe in supernatural intervention in my life, I strive to be the best human being I can be and to do all I can to encourage and enable others to be the best human beings they can be. The above piece seems to me a possible plan for approaching such a challenging goal. I've always noticed amaryllis flowers. 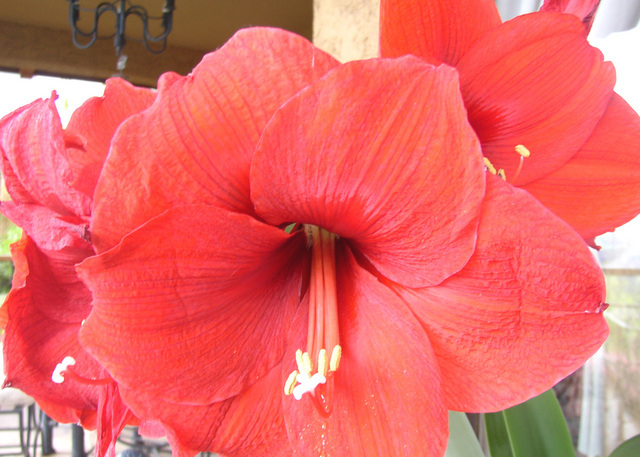 They are definitely a favorite but I have never seen an amaryllis plant as beautiful and as prolific as this Chilean one in the photo above. 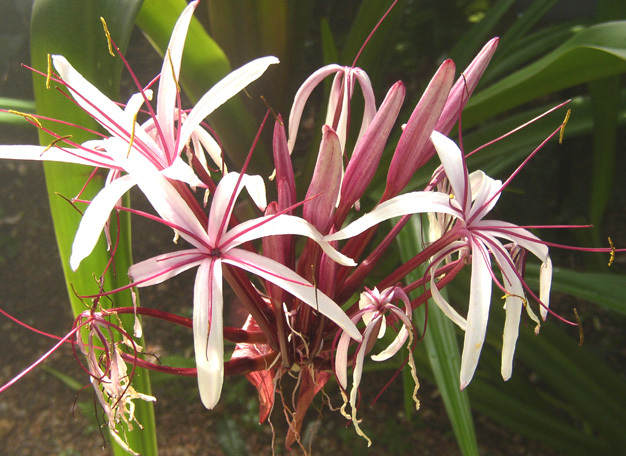 Although this is a closeup of only one blossom there were actually six perfect blossoms on the same plant. Flowers are just one more thing I appreciate--in someone else's house. I have killed more innocent plants than I care to count. I even manage to damage the "no brainer" green plants that supposedly "anyone" can grow. I hear stories of people putting their poinsettias in a basement or garage and holding them over to the next year--and the next. Not me. I can always count on budgeting for new poinsettias every Christmas season. Hmmm. For someone who claims to be a participant in life, I must confess that in not a few areas I am a total, but very enthusiastic, spectator. Like Pablo Neruda who never played an instrument but collected them for their form, who was afraid of water and couldn't swim but collected all things nautical and marine, I too collect and appreciate many things I can view and enjoy but not play, grow or create. In Neruda's case his many collectables became subject matter for several volumes of odes. Most of my collections are inadvertant, accidental or impulsive ones. The only intentional collection is our collection of people. Since 1980 we have hosted over 400 international adults in our home. Most stayed two or three nights (Servas Travelers). Others stayed five weeks (Denver International Program participants.) Still others we hosted for a month or two while they attended immersion classes in English at a local language school. A final group we call our "Friends and Family" program as it consists of friends and relatives referred to us by the official participants of all the other programs. It is this people collection that gives me the most pleasure--and the one that I nurture and tend and love the very most. Two trees, one juniper and one pinyon, grew together. A favorite stopping place when in our motorhome is Cave Lake State Park just outside Ely, Nevada on Highway 50. It just happens to be the right altitude and climate for Pinyon-Juniper forests. 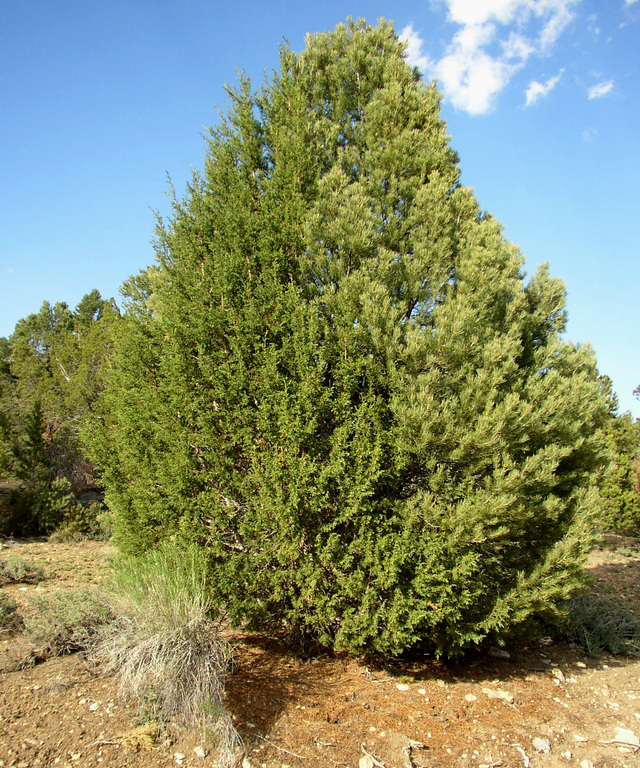 In this case the two trees appear to be one--the juniper on the left and the pinyon on the right. I had found them on a previous stop but this time I had my camera to capture the tree(s). This Chilean snail was our companion for a day. 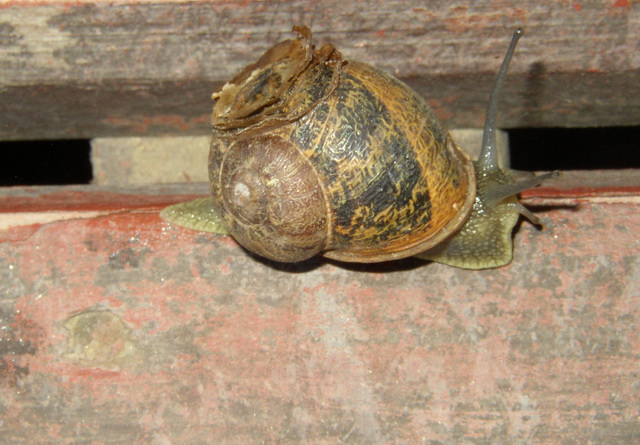 When we first arrived at Santo Domingo Beach and were settling into our quarters we noticed this snail sliding along upsidedown under a rail enclosing the front deck. The next morning it was on the bench. By afternoon it was gone. I love the fact that I can capture with my camera small creatures going about their daily contribution to the ecosystem. I'd never seen a snail quite so colorful. Like my friend E who collects sky photos at Five Acres With a View, I love clouds especially when they are backlit with colors. E has posted some spectacular ones lately. 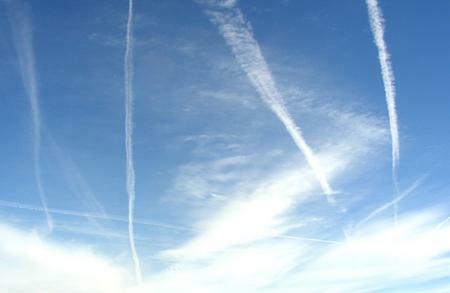 On stressful days, those days when I strive to get quiet and be small, I often look to the sky for perspective. Today is not particularly stressful but I am quite busy so the blog will feature a recent, and rare for me, sunrise. Lush green plants juxtaposed against bright floral outbursts are wonderful but I also love stark beauty like this view of Loveland Pass at 11,990 feet above sea level--about 400 feet above the tree line. Color is certainly not absent although the colors are more subtle. As we stood on the Continental Divide Trail five motorcylists turned the lower corner and made their way toward us. Later when we met them on the trail I thanked them for adding perspective to my photos. We chatted a while and discovered that they were five businessmen working in five different states who had joined to made a bike trip through the Canyon Country of Arizona, Utah and Colorado. What a trip that would be! 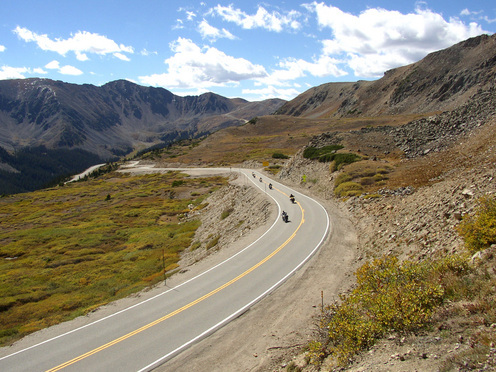 If you wish to see more of Loveland Pass, Click here for panoramic views in different climatic conditions. 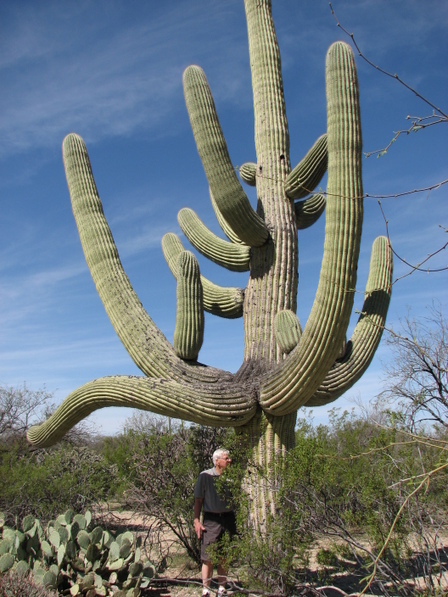 Though my husband spent 32 years flying airplanes, his university studies and his life-long avocation have been Biology and Ecology. I should have guessed, forty years ago, when he suggested that for our honeymoon trip we go to Isle Royale National Park in Lake Superior, 30 miles by boat from Duluth Minnesota, that I had signed on for a life-long course in the natural sciences. And so it has been. Much of my love of nature has been encouraged and deepened by his narrations on nature hikes that we take together. Though I love nature, I never can get through an entire book on beetles, lichens, trees, birds or Galapagos turtles. One dynamic of our relationship is that we each read what we love and share it. I read mostly poetry and fiction; he reads mostly non-fiction--primarily science and history; and we both benefit by the other's passion for their subject matter.. Taking a hike with my husband is always a learning experience. A few days ago we were hiking in the foothills and I asked what kind of conifers the trees were. 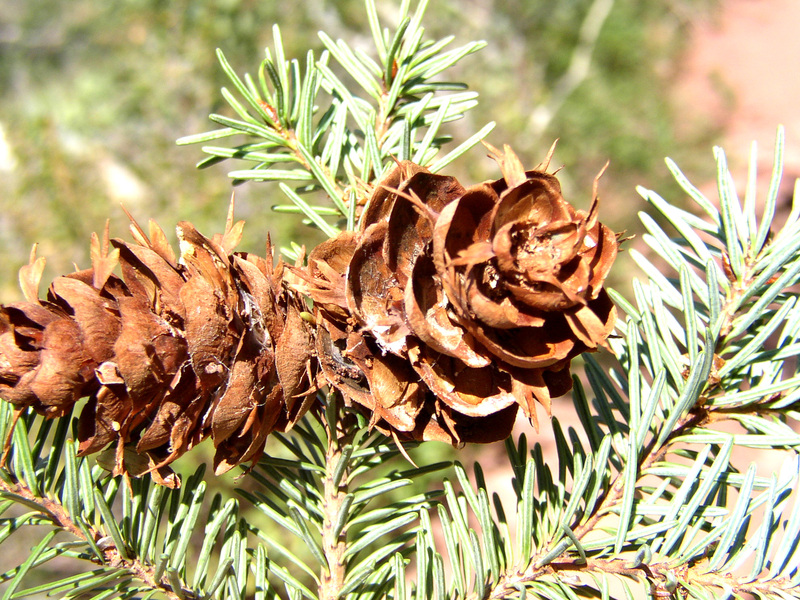 Once again he showed me in a way that I will not forget: Douglas Fir female cones have little snake-tongue appendages protruding from the cones. He studied to be a science teacher--before the airplanes stole his heart--but never pursued it formally. Instead he became a teacher-father and now, in retirement, volunteers as a teacher/tour guide for students on field trips to the DMNS. My principle form of exercise is walking and though I sometimes walk on the sidewalks and streets in my neighborhood, I prefer to drive 5 to 10 minutes to one of the several parks, greenbelts or nature preserves near my home. Yesterday I walked at Bluff Lake Nature Center. 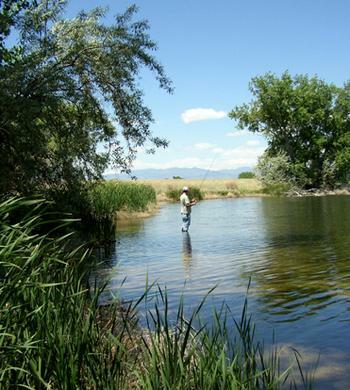 At the time we went we saw many birds and small animals resting in the shade of cottonwood trees but few actually swimming. As the sun slid lower, the mallards ventured out. We saw our first deer. Though we knew there was a small herd here, we had not seen any personally. We didn't stay as long as we usually do because of the mosquitos. We've had a lot of rain so the lake is high and a perfect breeding place for the little predators. As the election draws near I find fewer places where I can find peace. Many of the places I once went to for solitude have now become an issue in the campaign as two of my concerns, the anti-environmental "takings" of wetlands--such as the one in the photo--and the increase in the amount of mercury allowed to be dumped in waterways, are being highlighted as yet another failure by the Bush adminstration. It is increasingly more difficult to visit my favorite places without becoming angry at the squandering of our natural resources to benefit mining, drilling, logging or chemical corporations. I imagine this anger will just sit in the pit of my stomach until after the election. On our trip to Brazil in July we visited an area where few tourists go. Most of the families we met had never seen someone from the USA in person. Almost all of them asked if we approved of Bush. When we assured them that we did not, they shared that they were fearful of what Bush might do next. One man said he didn't judge all Americans by Bush but said that he feels that President Bush has become an embarassment for our country. That is a sentiment that has been expressed by many of our international friends. Another common comment is that they no longer want to visit the U.S. I really hope we can hold our heads higher after the election but I fear for the future of a country where half the potential voters say they think four more years of Bush is a good idea. "Alice Algae and Freddie Fungus took a lichen to each other." Now I always look for lichens and appreciate the beautiful display of impressionistic color created by the union of algae and fungi working together as "rock eaters." 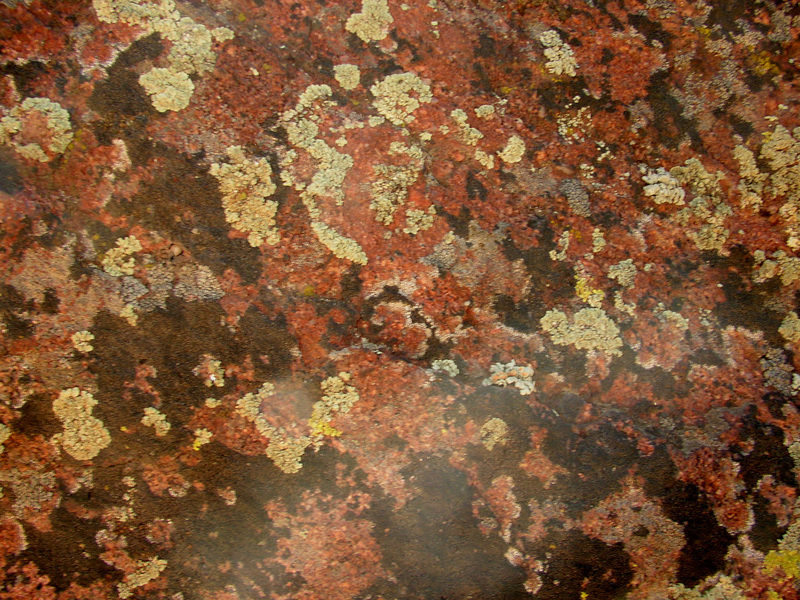 We even have a wonderful 800-page book with 900 photos of different types of Lichens of North America. After almost three weeks of post-trip overwhelm, I've finally surfaced to begin blogging again. 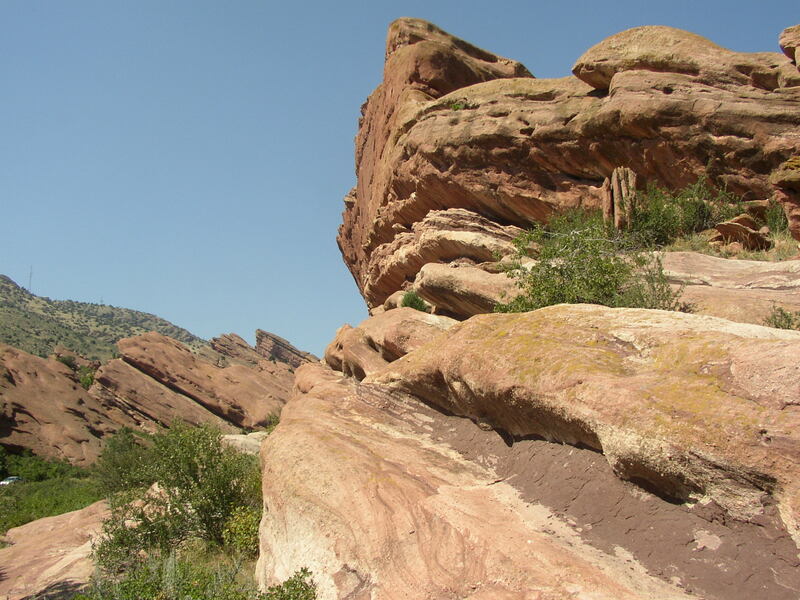 Needing a nature-fix, on Friday we hiked for four hours through my favorite Denver mountain park, Red Rocks. While the park houses the famed amphitheater where most Denverites have attended a concert, it also offers a system of trails through a geological unconformity where 300-million-year-old rocks are juxtaposed against rocks 1700 million years old. While I appreciate that a geologist can love "old rocks," I mostly love this park for its sharp energy and swirls of red color. 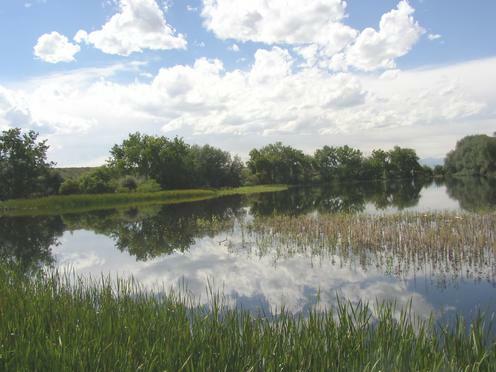 Yesterday we spent almost three hours walking through the wetland ponds and short-grass prairie at the Rocky Mountain Arsenal Wildlife Refuge. The Rocky Mountain Arsenal is still an active military clean-up site in that the central part of the 27-square-mile facility is still being decontaminated. The refuge, which is on the southernmost portion of the Arsenal, is open only on weekends and even then access is limited to the Visitor's Center and refuge. The arsenal was first activated during WWII and then again during the Cold War era. This was my first visit to the refuge since it was officially opened in 1992. Though I had heard about it from people who'd been there, I just couldn't get excited about visiting a place whose original purpose was to develop, manufacture and store nerve gas--and other deadly chemicals--for potential use in war-time against other human beings. Though it clearly looked like a military base, complete with the guarded entrance where we had to produce picture ID's, once we were inside and driving to the visitor's center it was absolutely breathtaking to look over acres of short-grass prairie with waving grasses and blooming wildflowers. The refuge has 7 miles of trails which wind through three wetland ponds that are home to many types of wildlife. Prairie seems such a simple word for such a beautiful experience, yet the cleansing effect on mind and body was equally as stimulating as mountains, forests or oceans. Check out this link for a little history and photos of some of the wildlife. In searching online for a good site about short grass prairies, I found this delightful and educational one called, Build a Prairie. I learned a lot and even recognized some of the grasses and flowers we saw yesterday. 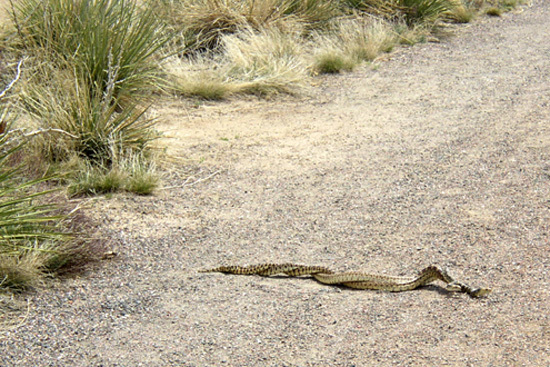 Two unidentified snakes interwoven and rolling together down a path. Yesterday I drove the 3.5 miles from my home to Bluff Lake Nature Center and walked for almost two hours. I saw an incredible amount of wildlife including four Great Blue Herons and these two snakes. I grew up on a farm/ranch in SE Colorado and learned early to tell the difference between bullsnakes and rattlesnakes. We always had bullsnakes near our graineries and silos that kept the mouse population under control. I have a healthy respect for snakes but do not fear them. 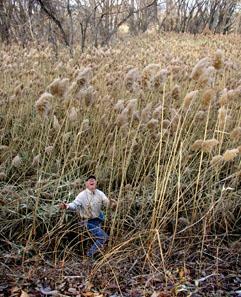 While walking on a path in the refuge I saw what appeared to be a stick rolling toward me on the path. As the distance between us narrowed I saw these two snakes wound together. As I stepped off the path and walked past them they must have sensed the movement and stopped moving long enough for me to get a photo. I don't know enough about snakes to know if this is common behavior, some mating ritual or part of the actual breeding. It is, however, the first time I have seen braided snakes. I like to think of myself as observant and in possession of a passable memory for detail, but ability and inclination fail to mesh when it comes to identifying and remembering names of birds, flowers and stars. It must be some sort of selective filtering--choices made in the subconscious. I can remember entire selections of poetry, phone numbers and addresses from 30 to 40 years ago but somehow it has never seemed necessary that I know the name of a bird to appreciate its colors and call. I've tried. When we travel I try to "name" unfamiliar animals and plants in my journal, but my mind still clings to the visual of "that beautiful red climbing flower beside the Saaremaa windmill." 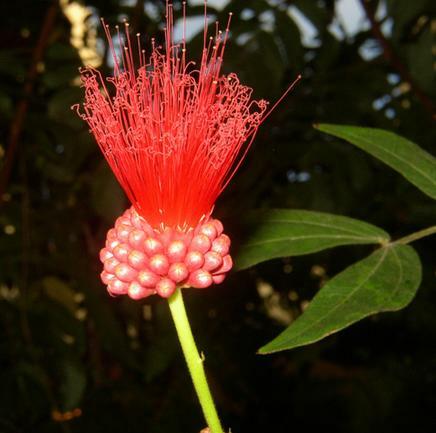 Ironically, I can often remember the name in the local language for a flower or bird I did not know the name of in English. My husband on the other hand not only can name all the constellations and their specific stars but inform me of the number of light years they are from the earth, yet he can only call our sons if I have their numbers on speed-dial.What is the process that determines what type of details and how many of them we file away in our brains for quick recovery? How do we prioritize what is "worth" keeping? And in the final analysis, do I love the unnamed inspiration less because I haven't taken the time or energy to identify it? I say not, but then I'm one of those with selective memory. On a sunny but cool Sunday afternoon we went to see the IMAX film, The Coral Reef. In a manner unique to IMAX the film vivdly depicts the beauty of Coral Reefs and the devastation resulting from global warming, over-fishing and irresponsible logging. Check out the link and the trailer--and if possible, go see this wonderful film when it reaches your area. It was, overall, an experience of spectacular underwater beauty but one that sent me home saddened by the lack of leadership in protecting our environment from the greed and insensitivity of those who have no long-term plans. Change is within the power of our leaders but many are politically obligated to those who only want to "get theirs" now-- just in case conscientious leadership of the future might demand environmental accountability. Today as I was reading my list of blogs on Bloglines, I found this link on J-Walk's Blog showing faces made from clothing. Why are some of us obsessed with finding objective images in clouds, rock formations, flower and tree arrangements--and now we go to check out faces from clothing? I only know that I have long entertained myself by trying to find the "more" that is in something and is just waiting for the observant to discover it. I have literally hundreds of photos that I took on the off-chance that I had discovered something unusual and fascinating that no-one else had seen. That is rarely the case but it is entertaining and a great excuse for extending the rest-stop on the hiking trail just a few more minutes. How many faces can you fine in the photo above? I found six for sure and--if I include slightly deformed and extra-terrestrial figures--I can push it to 9. 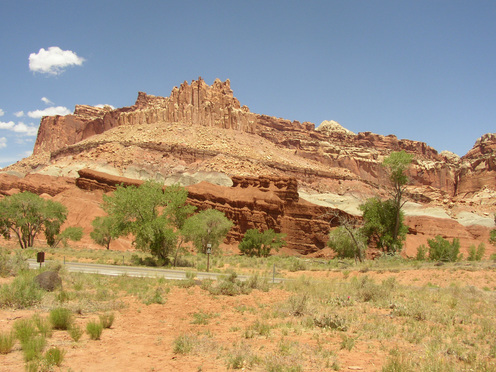 By the way Capitol Reef is my favorite National Park, partly because it is about 40 miles off the beaten path so the crowds aren't overwhelming. 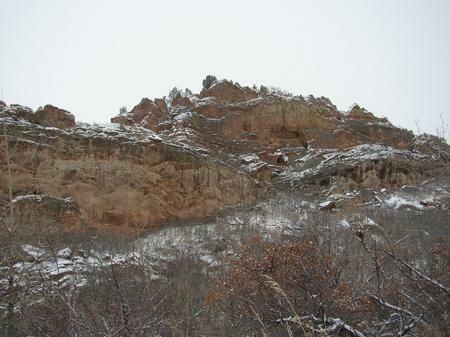 Within this geological wonder are some of the most spectular rock formations I have seen anywhere. 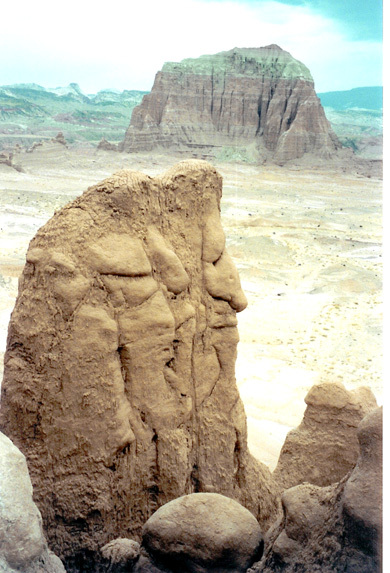 Check out some photos by the National Park System. Walking Stick insect on twigs. Yesterday it was 80 degrees in Denver so we went to the zoo. I particularly went in search of our new Okapi calf. She was born December 20 so is now just 3 months old. She is outside the barn but behind a slatted fence at the rear of the enclosure. There are only 100 Okapis in the world's zoos and very few births so this one is being well protected until the Vets and Zookeepers are sure she is strong. We could see her through the slats but not easily. Okapis were first discovered in 1901 and because their natural habitat is virtually inaccessible, nobody is really sure how many there are remaining in the wild. Afterwards we stopped in Tropical Discovery to see a new exhibit on Camouflage. I have always been fascinated by camouflage in nature and marvel at the many adaptations that insects and animals have developed to either avoid predators or surprise prey. 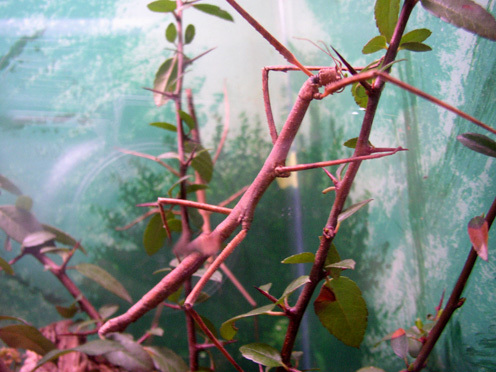 The photo shows a "walking stick" insect whose camouflage body allows it to "hide in plain site" among the twigs in its glass-walled container. There were also frogs, snakes and fish who exhibited special shapes, colors and designs to blend in or seem to disappear. I can think of many situations in the past in which I would have welcomed camouflage. Several months ago I recall hearing on NPR about a study of the different defense mechanisms people use to avoid uncomfortable social situations. The two under discussion were flight and invisibility. I didn't hear the entire program--and couldn't find it in the archives--but the summary of the study indicated that more men than women would flee uncomfortable situations and more women than men would choose invisibility. I have been known to attempt invisibility but was never really successful. I worked for 18 years in a business full of extroverts and high egos (Real Estate Sales) but have a lot of introvertive tendencies. In the early years, when it was time to work the crowd and get to know people who knew people, I would seek out a dimly-lit corner and mesh with the wallpaper. Over the years I improved my networking skills but never felt entirely comfortable: There was always somewhere I'd rather be. Snow--like in this photo taken exactly one year ago today. That single snow storm produced enough moisture to reverse the 3-year drought cycle in Colorado. Today-- one year later--we are in the middle of an entire week of 70-degree days being bombarded by predictions of a continuing water crisis. Last Wednesday Bob and I attended a noon-time lecture at the DMNS (Denver Museum of Nature and Science) by Bob Raynolds, our favorite geology instructor. 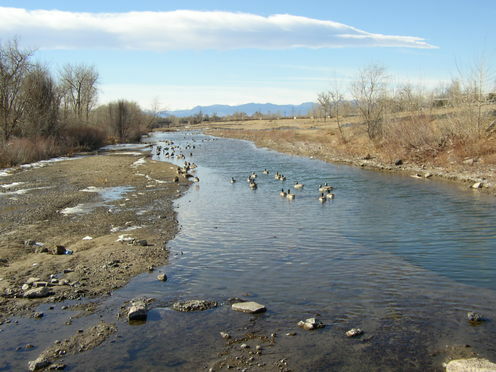 The lecture was stimulating and instructive; the news he presented was not: For at least 5 years he and several others in the DMNS Geology Department have been studying water levels in the Denver Basin. He presented data and slides that indicated several areas around Denver, most notably in Douglas County, that are now drawing water from a non-renewable aquifer that is reducing its water supply by 30 feet per year (approximately 1 inch per day) resulting in a prediction that this water supply will have been exhausted in between 10 and 20 years depending on how many new water taps are added in the next few years. Even in areas with renewable sources of water, most depend on mountain snowmelt to recharge reservoirs and that is not happening quickly enough to stave off drought. On these unseasonable 70-degree days the little snowpack that we have is being depleted by sublimation as the moisture evaporates rather than soaking into the ground or melting into rivers and streams which feed our reservoirs. As much as I love the warm sunny days, I'd enjoy them much more if we could have a good spring snow or a five-day rainy spell. 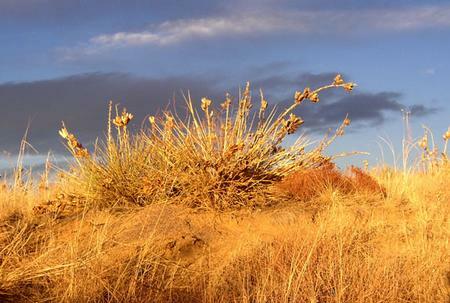 Our high desert climate can only sustain so much growth and most experts agree that we are currently on the edge of a statewide water crisis. Well, there is nothing I can do about it today so I'm going to have a tall glass of water, go walking in the sunshine and hope for desperately needed moisture. As much as I love Spring and all its symbolism of re-birth, new chances and optimism, I dread losing the naked reality of Winter, the "what you see is what it is" simplicity of silhouetted trees against sky or seedless grasses waving in chilled breeze. I'm not quite sure what it is that attracts me to bare--or dead--trees, disheveled crumbling buildings and abandoned rusting machinery. It's long been a private joke in our family: "Tell Mom to get her camera, I found another dead tree." Some of my favorite photos are of the ancient wind-twisted Bristle Cone Pine Forest on the road to Mount Evans near Denver. I don't have a morbid outlook on life or a fixation with death or dying--I just like the juxtapositon of lines, colors and curves presented by trees or buildings left to the vagaries of nature. We arrived at the Monte Vista National Wildlife Refuge at 4:30 p.m.--just in time to watch them feeding in the Refuge's planted grain fields for about an hour. Forty adults sat on a Monte Vista public school bus and listened as two Department of Wildlife Rangers talked about the wetlands, the feeding areas, the cranes and other wildlife that we might see. It was exciting to see the Great Horned Owls sitting in a near-to-the-road tree. We lowered our windows to see geese, mallards and coots swimming between the cattails and other wetland plants--but what we all had come for was to glimpse up close some of the estimated 26,000 Sand Hill Cranes resting and recouping strength in this refuge for the next three weeks. We were part of the 21st annual Crane Fest in Monte Vista, Colorado. 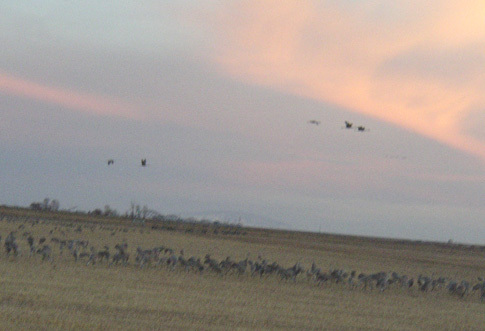 Eventually our bus stopped beside a field where thousands of cranes ate, chortled and occasionally jumped and postured in a courtship dance. The chortling reminds me of the common Middle-Eastern vocalizations used for cheering at athletic competitions. Sometimes it was muted--almost a quiet conversation--but as the sun sank lower, the volume and frequency of the chortling increased until finally a little after 5:30 the first few cranes lifted into the sky in the direction of the wetlands where they would spend the night standing in the water--to avoid predators. 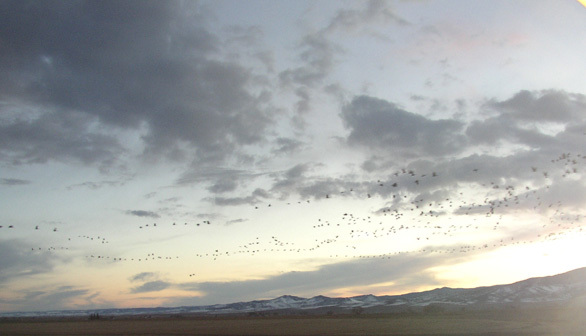 For the next two hours the sky was filled with small groups of cranes lifting off one after the other as if some unseen crane air-traffic controller was clearing them for take-off. At 7:30 when it had become too dark to see through binoculars and the several high-powered scopes that had been set up by the Rangers, we waited for the grand finale. And then, like the last great burst of fireworks on the Fourth of July, the sky was full of black specks silhouetted against an grayish-blue sky--and the spectacle was complete. The next morning we would arrive at 5:30 a.m. to catch a glimpse of the lift-off back to the feeding fields before we began our return trip to Denver. Though we were able to see them quite clearly--with the aid of binoculars and scopes--even the red splotch of color across their eyes, it was an event, a feeling, a communing with these magnificent four feet tall, 11-pound birds with 5 to 6 feet wingspans that could not be captured on my short zoom digital camera. One just has to be there. I cannot imagine what it must be like to witness the fly-in of the half-million cranes on the Platte River in Nebraska. 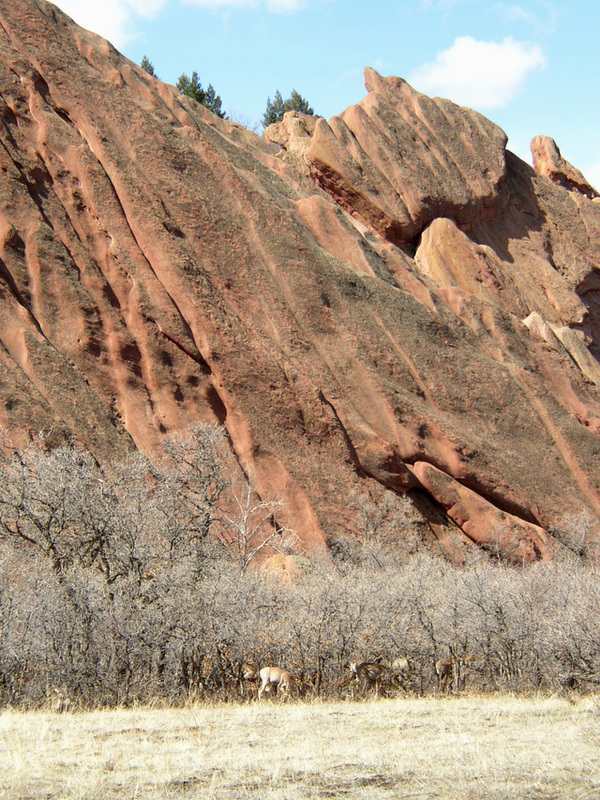 The rock formations in Roxborough State Park are of an iron-rich red color that prompted the Spanish Missionaries and Explorers to name our state Colorado--which means red in Spanish. 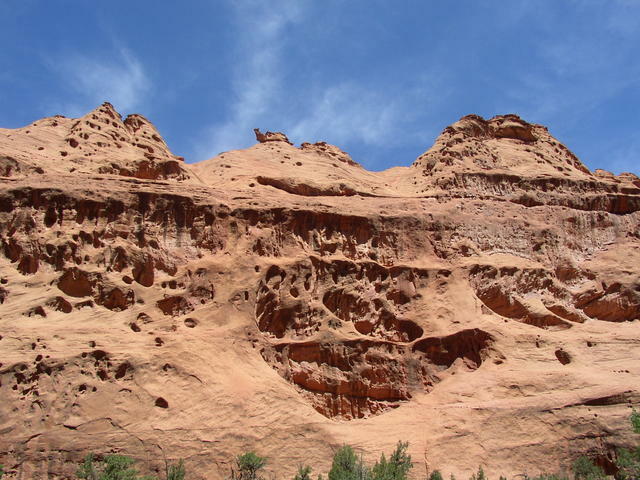 Throughout the state there are many red-rock areas but only along the upthrust of the "Hogback" which occurred 68 million years ago can you find such distinctive rock shapes. Garden of the Gods in Colorado Springs contains rocks similar in shape and color and are part of the same upheaval. The past three days the atmospheric conditions have encouraged condensation trails, the splotchy full kind that dissipate into buttermilk sky and stay around all day. Bob and I had a long discussion about clouds. 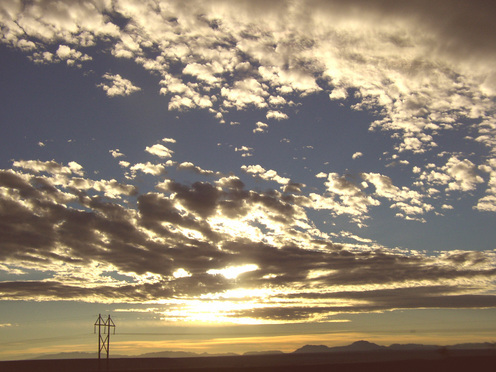 Bob knows clouds intimately, having flown over them, through them and around the more formidable of them for 38 years. His vocabulary includes terms like lenticular, fair-weather cumulus, altostratus and the totally non-scientific "thunderbumpus." He knows which winds make which shapes and which clouds are airplane-friendly and which should be avoided. Personally, I prefer to watch clouds, though walking through a low cloud on a mountainside is pretty spectacular. What a way to wind out the new year--with my head in the clouds! We spent three hours on this beautiful 52-degree day walking, watching and photographing Winter's beauty. Though we saw no wildlife other than birds, it was interesting how much was now visible that is often hidden behind leaves. We saw countless birdnests and gnarly naked cottonwood trees. I need to get back to walking again, so today I wore my pedometer for the first time in a long while and have so far today logged 9,600 steps. My goal is to walk 10,000 steps at least 4 days a week and it is so much easier to do if I walk where the wild things are. This photo was taken December 22nd in the Tropical Atrium of the Denver Botanical Gardens. I am so envious of this Powderpuff bud. I would like to be able to present myself to others with this kind of impact and beauty yet, even after all these years, in my 60's I still carry remnants of societal messages of my upbringing: Don't "show off," Keep feelings and emotions under control, Still waters run deep, Quiet people aren't the only ones who don't say much. I've captured explosive beauty many times, with art, with writing and certainly with photography, but these are all methods of witnessing beauty. I want to feel the impact of a personal explosion! 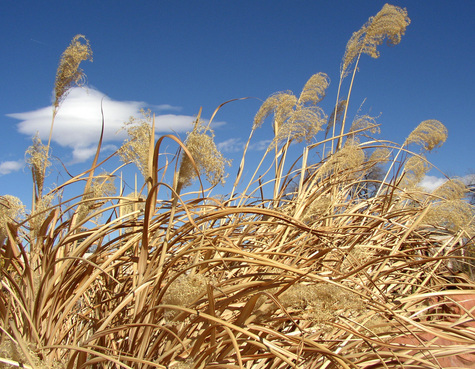 Colorado is known for its mountains but equally beautiful--to me, though perhaps in a less spectacular manner, is the Eastern Colorado prairie with its vast expanse and variety of grasses. While this photo was taken about 5 miles from my home--not actually in the prairie--it is just one example of the many grasses to be found in our state. The figure being minimized by the grasses is my husband Bob. A cold front moved in today. Snow is likely for the weekend. I fear that my favorite season has finally come to an end. This photo, which I call "Sunlit yucca with clouds," was taken six days ago and symbolizes all I love about autumn. How can one in love with autumn and spring ever really love this winter thing?